When you organize an event, the first thing you would want to accomplish when preparations for the event are all set is to make it known to the public so that there will be people attending. In this time and generation where the use of digital media is much preferred in promoting or advertising plan due to its wide reach, you might wonder if there are still some companies or businesses who would still opt for the traditional style of advertising. 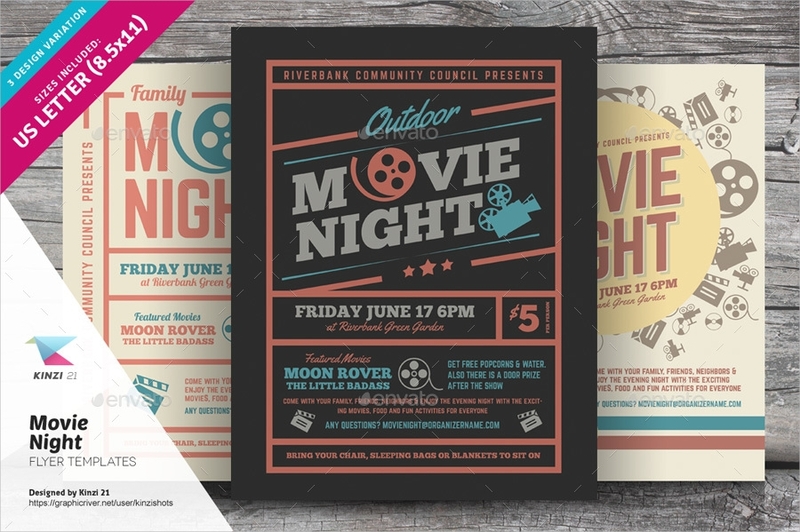 One of the many traditional styles and methods of advertising is the use of flyer designs. You might think that the use advertising flyers are already outdated and the people when receiving flyers, would not anymore read it, and there are even some people would not even accept flyers when handed one. However, as aforementioned, many are now adapting to advertise in the digital media. Now, think about it: wouldn’t your event standout if you use something that is not mainstream? Before, the use of digital media when it was not yet mainstream was kind of like the “in thing” then in the midst of the people and businesses were still using the traditional medium of advertising which was the use of newspapers, magazines, and televisions. But now that we are in the era when almost everything can be digitalized, the use of the traditional media may not be something new to the eyes of the people but it will surely feel nostalgic, thus, they are more drawn and compelled to read whatever you are printing on paper. 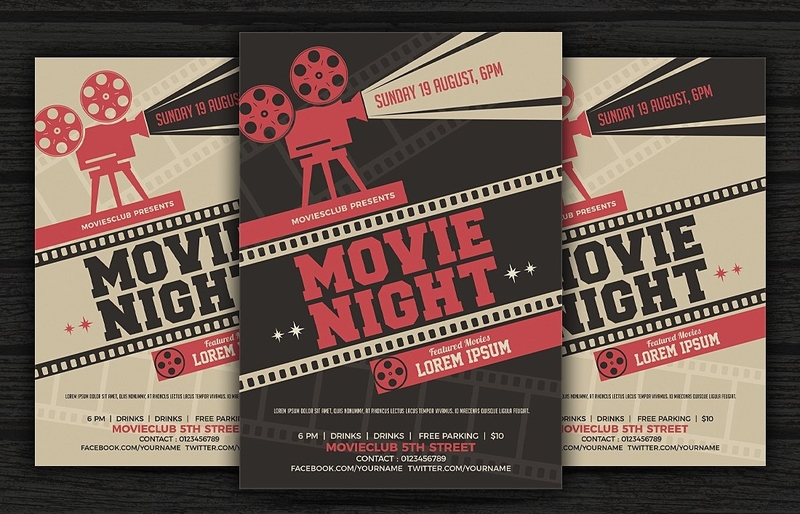 Say, you are going to hold a movie night event, a good and well-designed flyer can actually help you in attracting a lot of moviegoers to your upcoming movie night event. The downside of using flyers is that it does not have too much of a wide reach. However, you can turn that downside to an upside if you think this way: why would you want to have a very wide reach when at that case, you wouldn’t be able to figure out whether those people you have reached are indeed interested in going to your event? If you use flyers, you can directly hand it out to the people who would surely attend your upcoming event. 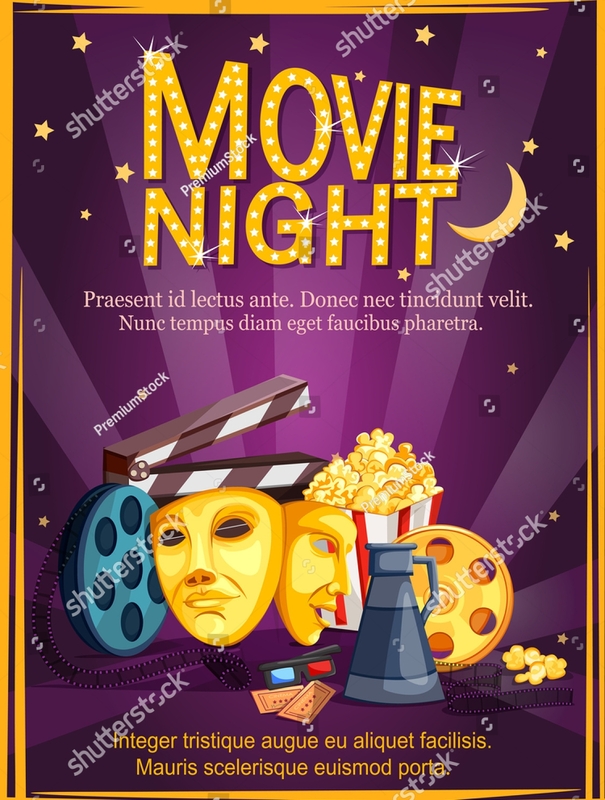 Since you are going to hold a movie night event, you can hand out flyers right in front of a movie house and hand it to the people coming in and out of the movie house. If you are lucky enough, you can notice that there are regulars. 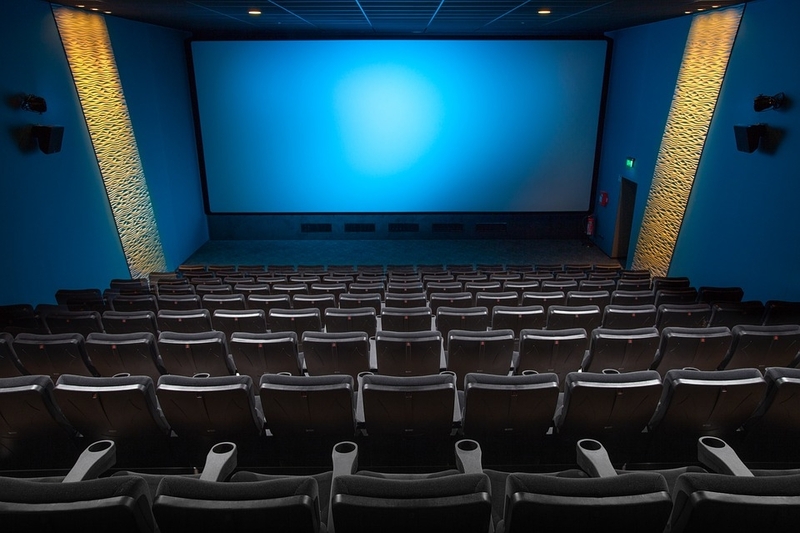 The regular ones are the solid moviegoers who would be ecstatic when they would receive your flyers and if you are luckier enough, they would be willing to show your flyer to their avid moviegoer friends as well. 2. If your Flyers are Nice to See and Nice to Hold, when People would Touch and Read it, it’s Considered a Date! Flyers are tangible, compared to the use of digital media where you could only see the digitized advertisement if you are holding your phone or browsing the internet. 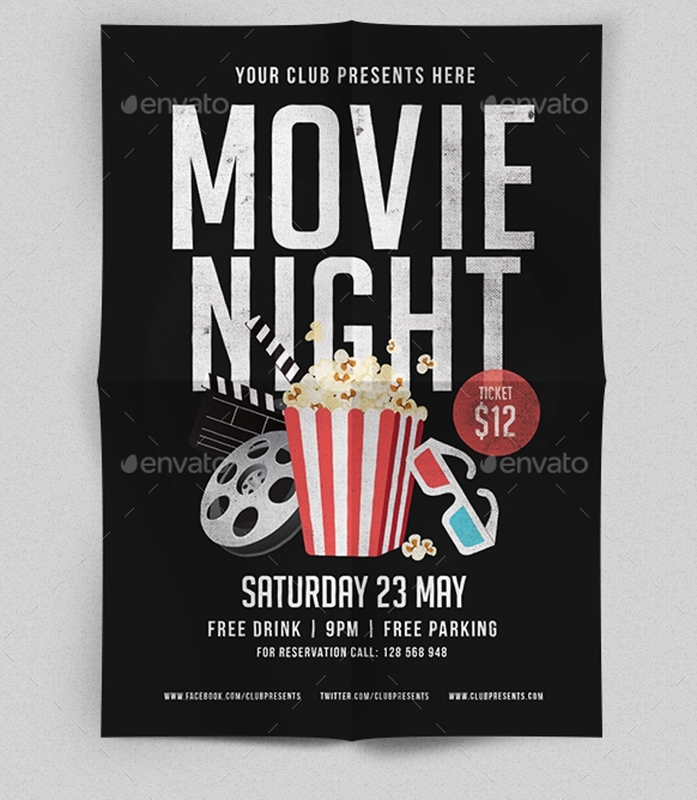 Since flyers are tangible, people can hold it and when they see that you have designed it well and that the quality of paper you used is good, this would encourage the people to attend your movie night event. People, no matter how they deny it, would fit the famous saying that goes “out of sight, out of mind”. For example, they would find an advertising material on the news feed of their social media accounts, they would be talking about it for sure, but the hype will die down once they would continue to scroll down their news feed and read other posts and completely forget about the advertisement of the event they just read. However, in terms of flyers, sure, once a person receives it, it’s either they read it immediately before putting it in their bags or immediately put it in their bag. But since it is in their bags, there is a big chance that they would be able to see it when they would go through their bags later on but with digitized formats of advertising materials, any post can be covered with another myriad of posts. Sure, it can be looked up on the main page of the one who advertised the event, however, would a person look it up if he or she has completely forgotten about it due to the myriad of posts he or she has read right after seeing the digitized advertisement? Most likely not. 3. Making Flyers Exercise your Creativity. Creating flyers would exercise your creativity as the conception of an idea would require you to think of how you are going to make things attractive and appealing to your target audience. Once you exercise your creativity even if you are not that creative and artsy in the beginning, you will eventually produce masterpieces since constant practice and exercise of anything can help in improvement. It is in wanting your flyer and the event your flyer is advertising to stand out and attract people that you would be able to exercise your creativity well. And once you focus on the creative aspect, your life will be improved, you would become capable of doing other creative things such making the layouts of your PSD menus, greeting cards, and other printed matters that would require a beautiful design and layout. 4. You Create a Buzz that will be Useful for your Other Upcoming Events. 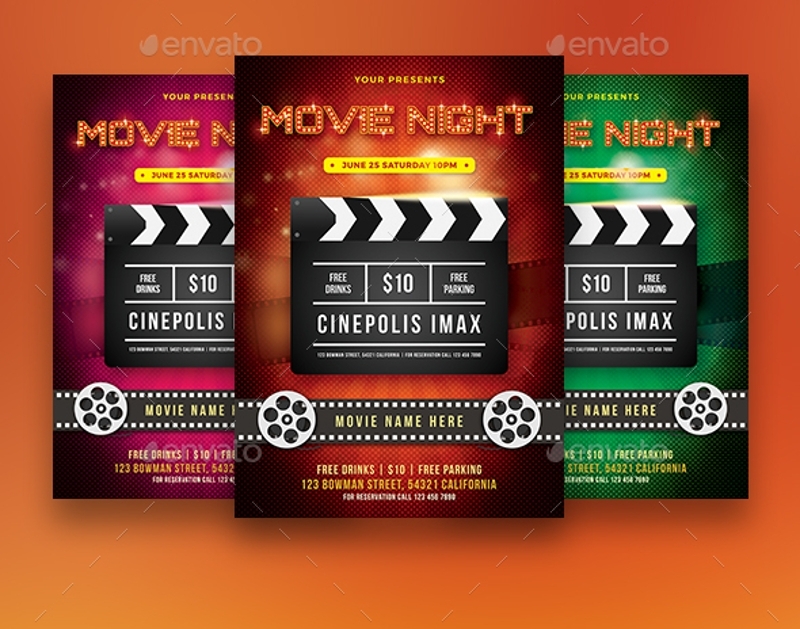 Say it’s your first time to create a movie night flyer for an event in your business and that people loved it, do you or do you not think your other event flyers would be loved equally? If it has been beautifully designed, then do not just expect an equal amount of love but expect more. There could be a lot of attendees who are encouraged to attend your event because they are a fan of it or that they can relate to it. 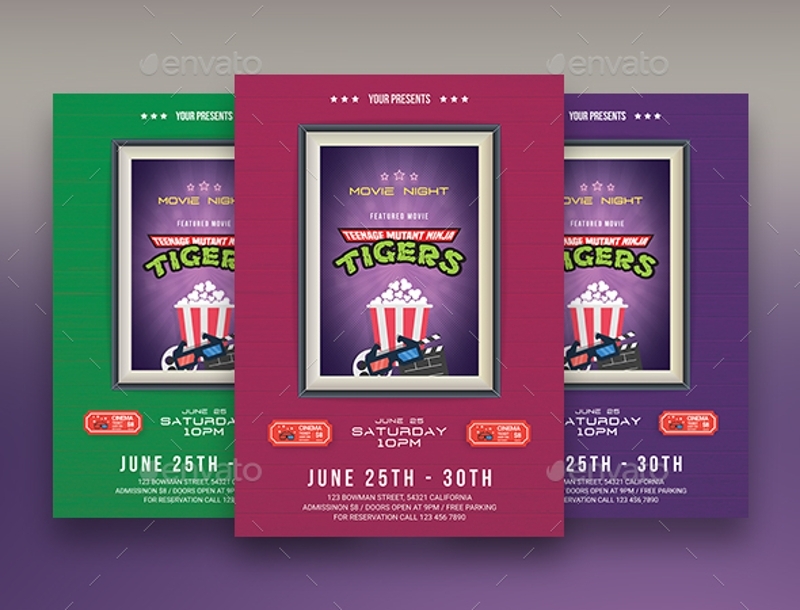 However, there are some people who get encouraged to attend a certain event because the way the event advertisement was advertised to them was visually appealing. Anything that could please the eye will surely attract curious eyes. 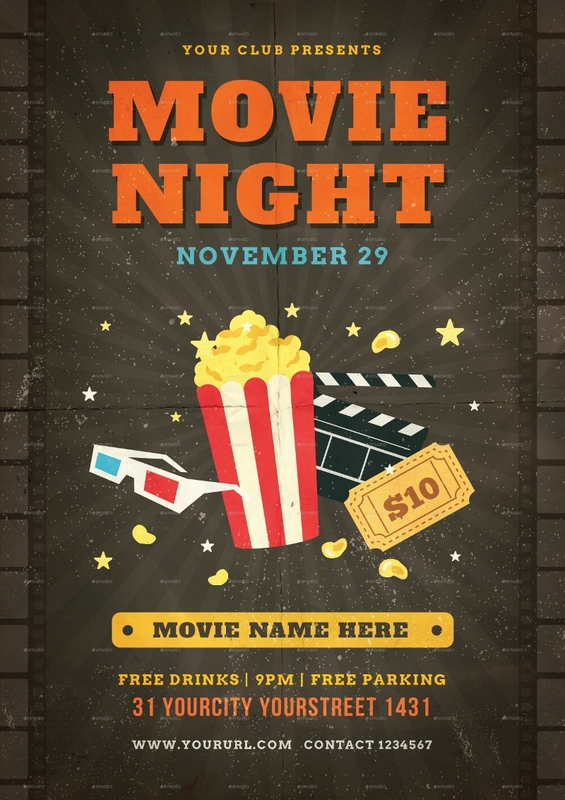 Make no mistake on your first movie night flyer to make to date because this is a prerequisite to the future buzz you will create in the days, months, weeks, or years to come. Creating a buzz about your event is good because we all know that the main purpose of an advertisement is to be able to sell. And, once you create a big kind of buzz, it means that you have succeeded. Other forms of printed advertising can be quite pricey since it might need more sheets of paper and ink in order to be reduced. Sure, digitized advertising is also cost-effective since you would not anymore need to produce anything since the people who would like, share, and comment on it are the ones who are doing the production and the spread the news about the event you are organizing. But remember that is with the use of flyers that you would immediately go straight to your target audience. Flyers are the most flexible form of printed advertisement to date. When you would fold a flyer into three sections, you can put it in an envelope and mail it to people who are far enough to receive your flyers personally. When you fold it in half, it turns into a leaflet or brochure design that people would enjoy flipping as they read details and see your designs. 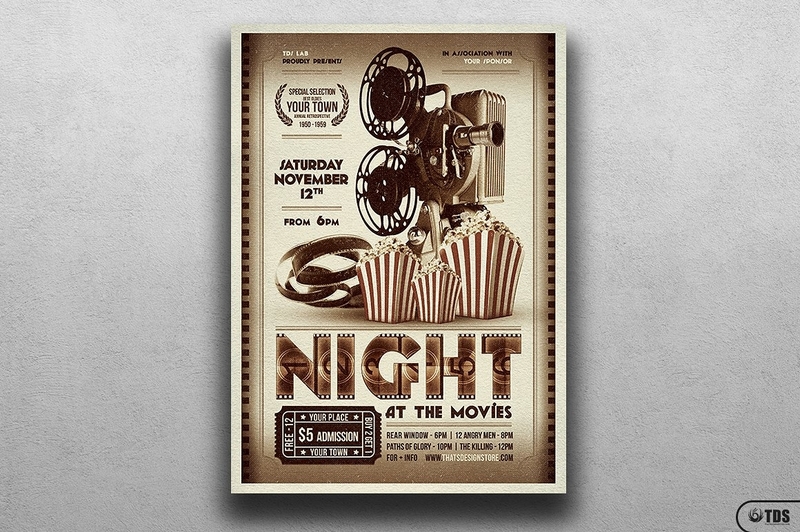 When you post your movie night flyer on a wall, it immediately creates a buzz like a poster design that people would immediately notice when they would be walking down the streets. 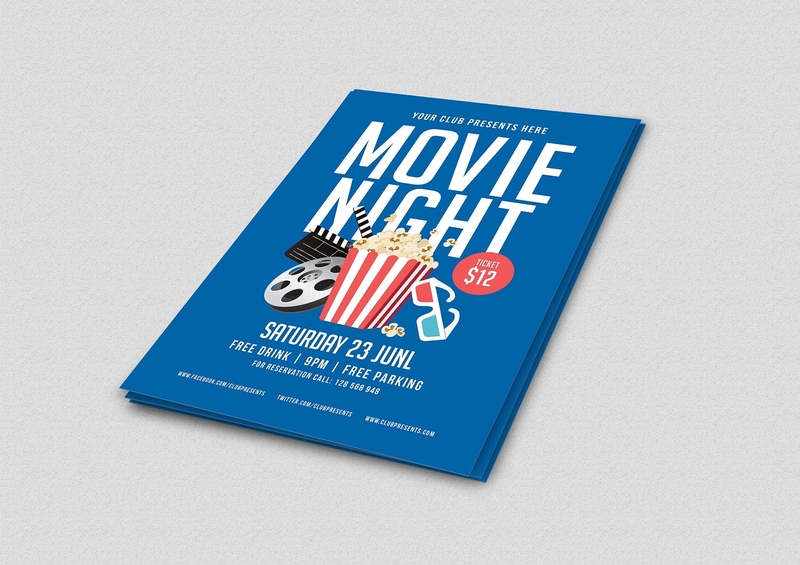 When you print it using an extra paper that is on the thick side and shrinks its size a bit, your movie night flyer becomes a postcard design that you can send to people across the globe. 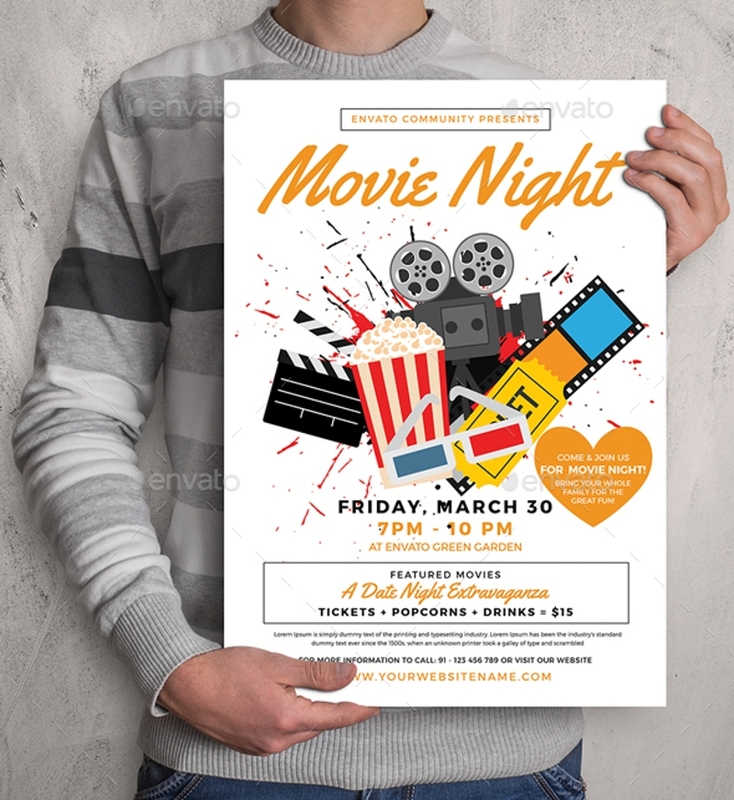 And, when you would want to have a digitized format of advertising that would go along your movie night flyer, you can always turn your movie night flyer into a digitized format that you can send as an email or message to people you know would attend your movie night event. As aforementioned, flyers could turn into various traditional printed media formats. 2. Using Flyers is Affordable and Budget Friendly. 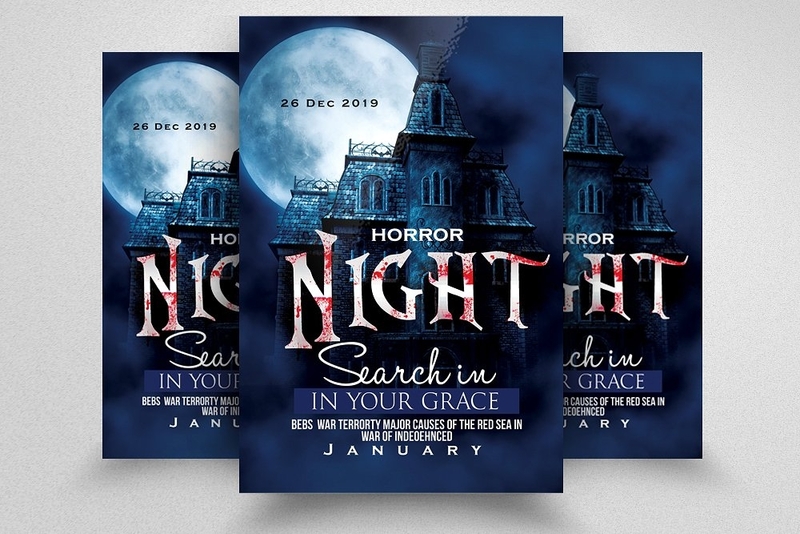 Producing flyers is not that expensive and you would only need to spend on the printing and to pay the designing services if you are not the one designing it. Flyers only consist one sheet of paper that does not have to be thick and it can be easily placed in the bags of the people you will be handing it to. 4. Flyers are Easy to Design and Layout. 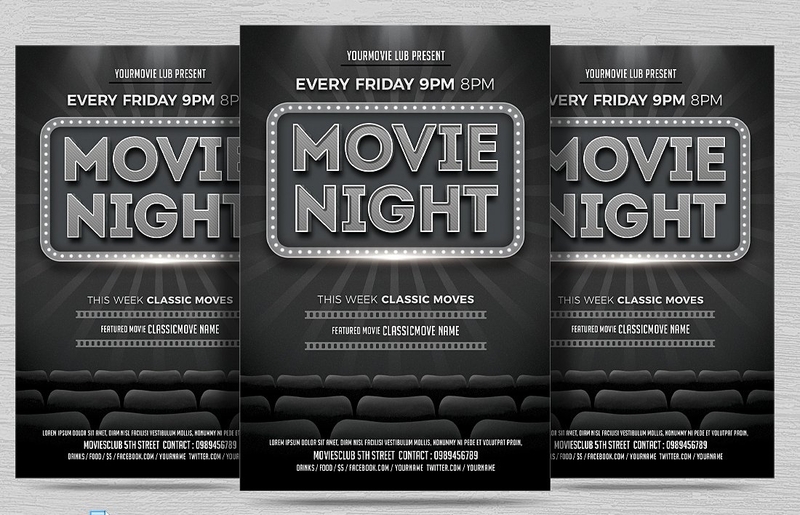 Flyers consist of only one page and one-page design and layout are not that much of a daunting task to do. 5. Flyers could Easily Grab the Attention of your Target Audience. Well-designed flyers can attract a whole lot that you will be assured that there will be a lot of people attending your event. 6. Flyers are an Avenue to Market your Business. Flyers are also an avenue to market your future events. 7. Flyers Showcase your Creativity. 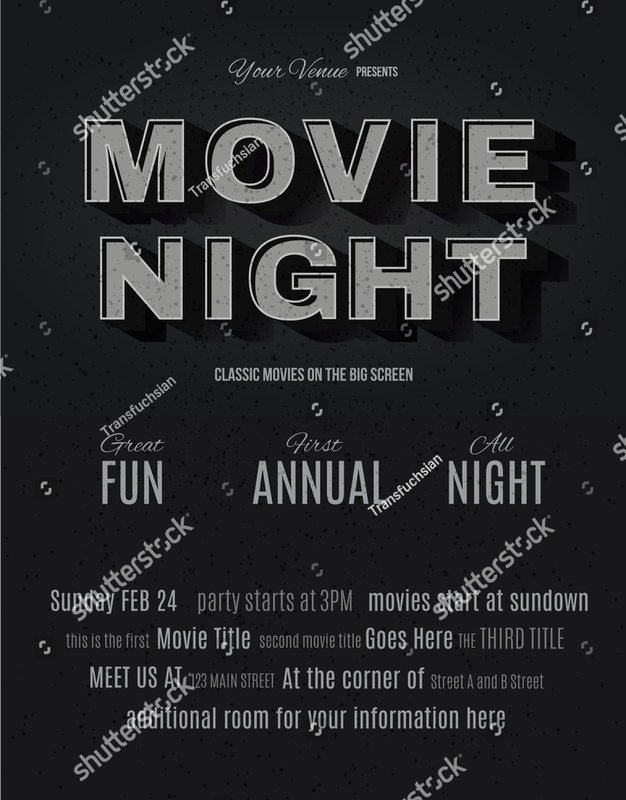 If you are the one who designed your movie night flyer, you will be able to show that aside from an organizer, you are also a creative person. 8. Flyers Enable you to Receive Feedback from People. What’s more fulfilling than receiving feedback emails from people you would love to hear feedbacks from?